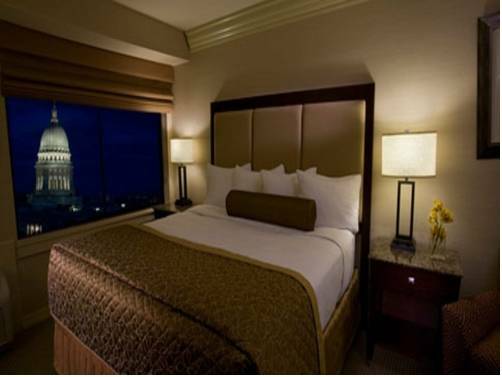 Named best hotel by madison magazine and hotel with the best service by wisconsin meetings the madison concourse hotel and governors club is located in the heart of downtown madison just steps from the state capitol state street monona terrace convention center and uw madison. Enjoy breakfast lunch and dinner in the signature circ restaurant and cocktails in the bar. The hotel offers the brand new concourse premier rooms and state-of-the-art fitness center the hotel provides a complimentary airport shuttle - 27000 sq ft of meeting space - underground parking - circ - the bar and an airline boarding pass kiosk. All rooms include premium dayton street Comfort collection bedding compact refrigerators 37 inch flatscreen tvs and complimentary wireless internet. The 100 room governors club executive level features concierge and complimentary cocktails hors doeuvres desserts and deluxe continental breakfast in the private lounge overlooking the state capitol. Circ: Cuisine Type - American Breakfast from 6.30 am Monday - friday and 7 am saturday-sunday lunch is served 11.00 Am -02.00 pm daily and features a salad bar during the work Week. Dinner is served from 5.30-10pm monday through saturday. THE BAR: The Bar offers specialty cocktails microbrews and an extensive wine list. Breakfast lunch and dinner are served daily during renovations. Daily. Hours are monday-friday 2.00pm-1.00am saturday 11.00am -1.00am sunday 11.00am -12.00am. GOVERNORS CLUB ONLY: Private lounge offers complimentary breakfast top-shelf cocktails hors doeuvres and desserts. The Madison Concourse Hotel and Governors Club is located near the State Capitol State Street University of Wisconsin Monona Terrace Convention Center Alliant Energy Center and 10 minutes from Dane County Regional Airport. Visit www.concoursehotel.com or call 800-356-8293 for directions.